For those who were used to seeing the Buddha flanked by the great tormas, Mount Kailash rising behind, and masses of flowers arranged on all tiers of the stage, this year’s design must have come as something of a surprise. The stage and its backdrop are a magnificent fusion of classical Chinese elements and the uncluttered clear-cut lines of modern design. The arrangement is a co-production between His Holiness the Karmapa and a professional stage designer from Shanghai, who first met His Holiness at Tsurphu Monastery in Tibet in 1999. In an interview, the stage designer explained how, traditionally, Tibetan settings use rich, strong colours, are very elaborate, very expressive and powerful. They are stunning and have great visual impact. When the Karmapa first suggested that the two of them should collaborate on designing the stage for the 34th Kagyu Monlam, the designer focused on how to capture in a new way the grandeur and solemnity of the pujas offered during the Monlam. He wanted to emphasise those particular aspects, and, so the backdrop was originally designed in very stark black and white. Later it was changed to gold and white. The backdrop is made of heavy white canvas in order to resonate with the colour of the marble flooring of the stage and its tiers, and is covered in a pattern of highly stylised, auspicious golden clouds, painted according to those found in classical Chinese texts. These clouds symbolise brightness, vastness and unhurriedness, and are intended to reflect the qualities of Lord Buddha. The motif is continued into each corner of the stage, either side of the huge screens, and a Tibetan-style frieze, unifies the whole. The tormas have been moved down from their previous position where they flanked the Buddha on to the main stage. This clears the area around the Buddha image, creating an additional sense of spaciousness and open-ness, but also brings more focus onto the tormas themselves. Visual distractions have been reduced and flower displays kept to a minimum. The tiers on the wings, where the gelong and gelongma sit, have been covered in red carpet and the risers have been painted red; changes intended to create an holistic harmony. 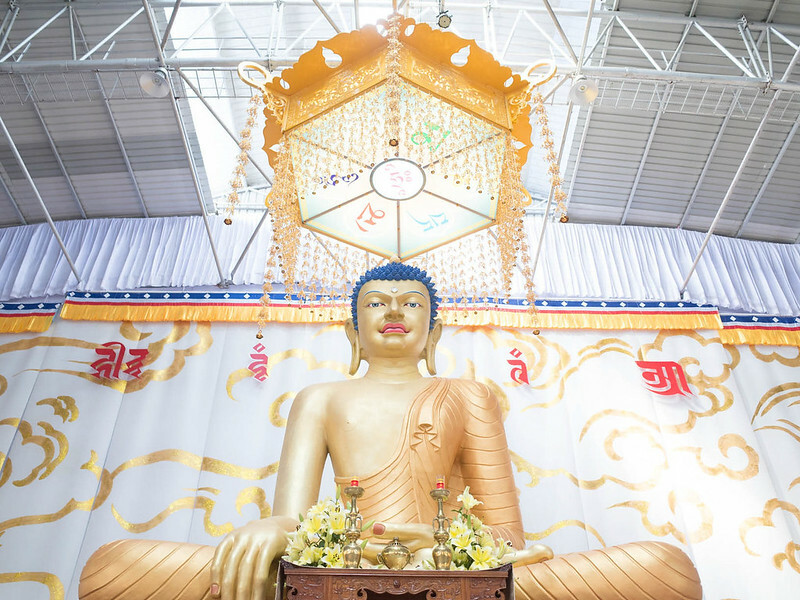 Above the Buddha, suspended from the girders, as if floating in mid-air, is a huge intricately designed chhatra or parasol. An ancient Indian symbol of kingship, it is depicted above the heads of Indian royalty, Hindu deities, Lord Buddha and the bodhisattvas. The chhatra is in an ornate Chinese style and made from gilded copper. Inside, directly above the Buddha’s head, is a mandala of the Mani prayer, Om Mani Padme Hum, the sacred mantra of Avalokiteshvara.